A smart mirror is a two-way mirror with an electronic display behind the glass. The display can show the viewer different kinds of information in the form of widgets, such as weather, time, date, and news updates. This product would be useful for busy individuals that want to multitask and stay informed while on the go. Instead of constantly pulling out a device, one could get informed while finishing daily grooming tasks. I designed and built my own prototype and delved into the world of do-it-yourself smart mirrors. The basic design of a smart mirror starts with the glass that is to be used. Two-way glass is the recommended type as it lets the graphics on the display come through clearer. Vanity Vision glass was used as it is an optimal choice for building smart mirrors. I used an Android tablet as a display to be mounted on the back of the mirror. The rest of the glass around the display was blacked out by use of black cardboard to ensure that there was a good reflection. 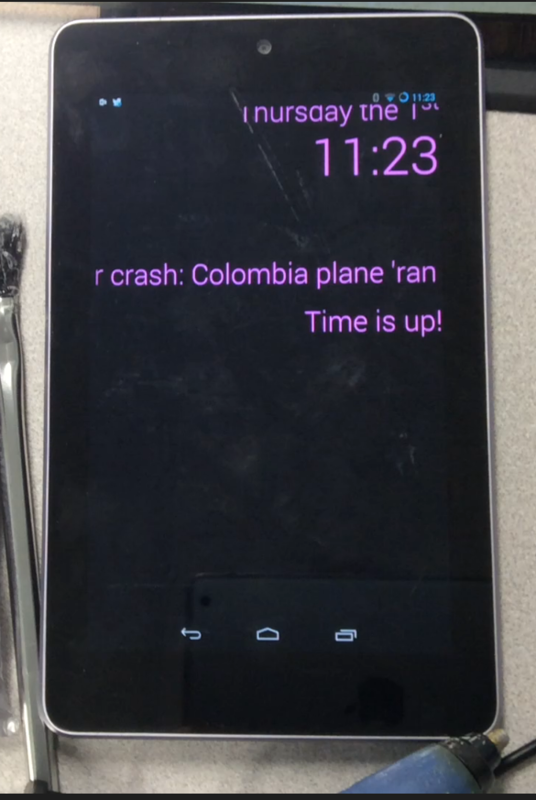 Upon uploading the code to the device from Android Studio, the widgets of time, date, real-time weather and news updates were visible through the front of the glass while reflecting the user’s image on the mirror. The electrical component of this project was a simple Android tablet device mounted to the back of the glass. I used the smart mirror code on GitHub and connected the device to my laptop. I then uploaded the code to the Android device which booted up the display for the smart mirror app. The code has built-in features for modification of design of the application.The device must be connected to Wi-Fi in order to gather the correct data. The device must also be plugged in to a power source. Originally, I wanted to incorporate an Arduino Uno to add sensor features like the Adafruit PIR motion sensor so that when movement was detected, it would turn the mirror on and off when someone walked in front of it, thus saving power. The data is collected by the code installed on the device, which is transmitted by Wi-Fi signal, and presented on the screen of the device which is displayed through the glass to the user. 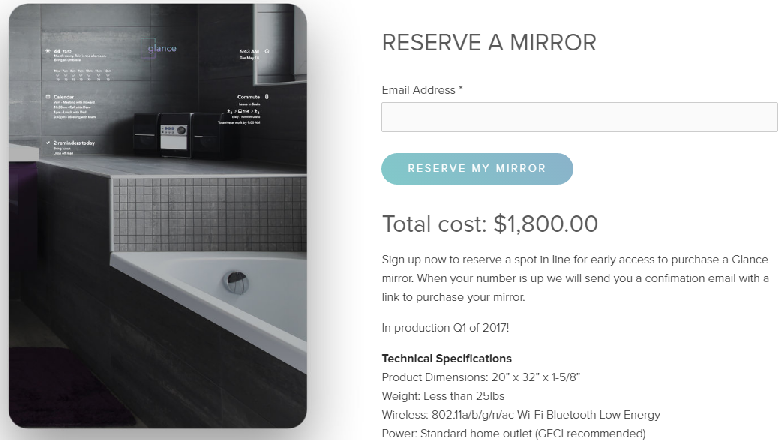 Current products on the smart mirror market are expensive. For instance, a mirror through Chicago-based Glance Mirror (glancemirror.com) is $1800.00. My mirror, on the other hand, was produced for under $100. This is not including the cost of the Android device because I used an old device that was not in current use. The initial and final prototypes used four panes of Vanity Vision glass that were $0.95 each. I used salvaged wood for the frame. If it were to be purchased new, total costs would be around $30. All the rest of the hardware supplies totaled around $20. If a production-ready prototype were to be produced, I would use higher-grade materials and display device, which would drive up the cost significantly. However, I am sure that I could build an efficient and attractive model for under $1,800. This product has great potential mostly in luxury markets due to current high costs. As of today, do-it-yourself electronic hobbyists produce most smart mirrors, aside from a few small companies. From a small survey, I concluded that it is extremely interesting to people and that they would be interested in purchasing one for their own home. Smart mirrors can be produced quite easily depending on how complex one wants to make it. This has given me great motivation to continue building smart mirrors for friends and family and possibly try to gain employment at Glance Mirror or a similar company.